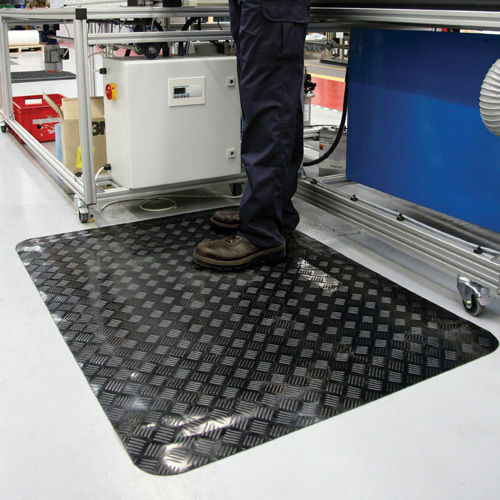 The ergonomic rubber mat is a soft rubber mat used in places where workers have to stand in one place for long periods of time. The ergonomic rubber mat supports the workers’ posture and prevents their legs from fatiguing. The surface guarantees a safe, non-slippery area even when wet. We offer a wide selection of rubber mats with different surfaces: checkered rubber mat, fine ribbed rubber mat, diamond pattern rubber mat, round stud rubber mat, dielectric mat. The underside of the mat is made of porous rubber, which ensures the softness of the mat. The standard ergonomic rubber mat is black and 11 mm thick and 1200 mm wide. It is possible to order mats in different thicknesses and widths according to our clients’ needs. Please contact us for more information.